The Nordic countries share many food traditions, none more delicious than klejner, a deep-fried pastry that dates back to the middle ages and is a common Christmas treat across Scandinavia and Northern Germany. Some differences persist. Danish klejner are typically unleavened. The same is true for Swedish klenäter. In Denmark, we also have Norwegian klejner, which are more akin to a yeasted donut than a cookie, where as in Norway, they are called fattigmann (literally translated: poor man) and are unleavened. 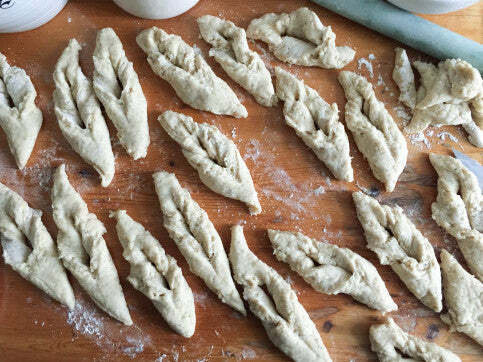 They may be flavored with cardamom or cognac. In Iceland they are called kleinur and they are leavened with baking powder, making them perfectly crisp on the outside and soft as a pillow on the inside. They’re larger than most other Scandinavian klejner and normally flavored with lemon. Best of all, they eat them year round, a custom I plan on adopting. This recipe comes from a baking course I participated in this fall, led by an Icelandic pastry chef called Ásgeir Sandholt, a fourth generation baker who works at Sandholt Bakery in Rejkjavik. Sandholt Bakery is particularly well know for it’s croissants and indeed that was the focus of the course. But Ásgeir took the opportunity to share a few Icelandic recipes with us too: flatkaka, a rye flatbread served with smoked mutton and pickles, an incredible skyr-based dessert with wild blueberries (brought all the way from Iceland for the occasion!) and, of course, kleinur. Kleinur are best the day they are made the minute they are cool enough to handle, so don’t make more than you can reasonably consume or share in a day. Adapted from a recipe by Ásgeir Sandholt. 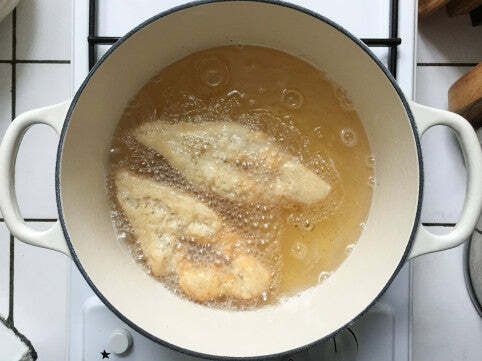 In a small saucepan, heat the milk, sugar, vanilla bean and lemon peel to approx. 113°F (45°C). Set aside. In the bowl of a standing mixer fitted with the dough hook, whisk together flour, baking powder and salt. Add egg yolk, butter and buttermilk to the dry ingredients and mix briefly. Remove vanilla bean from the milk mixture and add it to the dough, mixing everything until the dough just comes together. Scrape down the sides of the bowl and knead for another 30 seconds. Cover and set aside for 30 minutes to rest. On a floured surface, roll out the dough about 2/3 of an inch thick. With a knife or a pizza cutter, cut the dough into oblong diamonds, about 3 inches long and two inches wide. Then cut a slit about an inch long down the middle of each diamond. To shape, pick up each diamond and pull one end through the slit to form a knot. The dough will be soft and tacky and a little hard to handle, but try not to work in too much additional flour as you shape the kleinur. Meanwhile, heat 2-3 inches of oil to 350° (175°C) in a large saucepan. If you don’t have a thermometer, you can check the temperature by dipping the handle of a wooden spoon in the oil: if the oil bubbles around the handle, you are good to go. Carefully drop 2-3 kleinur in the oil at a time, cooking first on one side until golden brown, about 1 to 2 minutes, then flip them and cook on the other side for another minute or so. 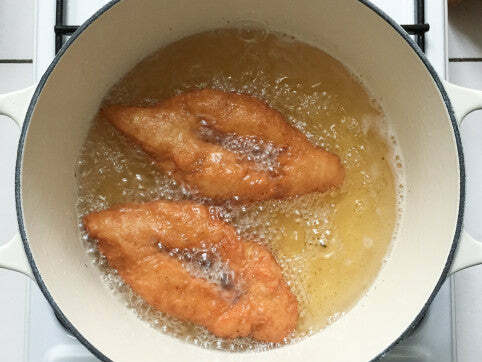 Keep a close eye on them and remove from the oil as soon as they are deep golden brown. Drain the kleinur and spread them on a plate or cutting board lined with paper towels to absorb any extra oil. Repeat with the remaining kleinur, checking the temperature of the oil between each batch. Dust kleinur with confectioners sugar and eat immediately!